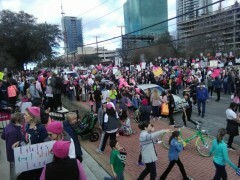 Thousands turn out for Dallas Women's March | Fight Back! Dallas, TX - Thousands of people turned out here, Jan. 20 for the second annual women's march and proceeded from Saint Paul Methodist Church to Pike Park. The focus of the march was anger at U.S. President Donald Trump, with many signs calling for his impeachment or resignation. But other signs referred to issues such as ending police brutality and freeing Palestinian political prisoner Ahed Tamimi. At Pike Park, speakers addressed the crowd from the gazebo. However, the turnout was so high that most marchers could not fit in the park and relatively few could get close enough to hear the speeches.